9th April 2016 – Following the bombshell announcement by the International Consortium of Investigative Journalists (ICIJ) on April 3rd that they and a select group of 400 journalists scattered around the globe had, for the past year, been secretly working to sift and analyse 11.5 million company documents leaked from Panamanian “Wealth Management” company Mossack Fonseca by an anonymous whistleblower which laid bare the sheer scale of global tax avoidance networks used by the rich and the corrupt and which also (in the first very, very small tranche of released information) included British Prime Minister David Cameron’s late father’s “Blairmore Holdings” tax avoidance vehicle, from which tax haven arrangement it very soon became clear (after four days of pompous denials, red-faced half-truths and arrogant attempts to deflect, then finally to fully confess) that the Prime Minister had personally profited from Blairmore, thousands of outraged protesters descended on Downing Street dressed in Hawaiian shirts, Panama hats, sunglasses and tropical colours to noisily demand that David Cameron resign. After a couple of hours of beach-ball throwing, speeches from activists and plenty of sloganeering the protesters dashed up the road to protest outside the nearby Grand Connaught Rooms where David Cameron was addressing the Conservative Party Spring Conference, and it was on the steps of the hotel where Kaya was photographed, brandishing his satirical painting of David Cameron as a monkey brandishing a paintbrush loaded by Conservative-Blue paint and artist’s palette as he paints a picture of the Three Wise Monkeys – symbolising the Mafia-like code of silence and willful blindness to wrong-doing by the rich, the powerful and the corrupt. In 2012 David Cameron had made public press statements criticising British comedian Jimmy Carr for using a “tax-efficient” tax haven scheme, calling the comedian’s behaviour “Morally repugnant“, and it was this apparently massive hypocrisy which offended people so badly, but which also dramatically put the political spotlight on the absolutely outrageous amount of wealth which is taken out of the global economy and hoarded by greedy rich people, corporations avoiding contributing correct tax revenues to the countries they operate in, criminals laundering drug money, arms dealers, corrupt leaders, politicians and more, estimated in 2012 to be somewhere between £21 – £32 trillion. It was very rapidly pointed out that though Mossack Fonseca had created over 250,000 shell companies for clients with the sole intention of hiding money from tax collectors on behalf of their national governments, they were just one single company operating out of just one of more than 90 tax havens scattered around the World – the majority of them Crown Dependencies administered by Her Majesty’s Obedient Government on behalf of the City of London! The scale of the corruption is truly vast and almost beyond comprehension, and because of strict codes of secrecy it is impossible to see where all the money has gone and who has taken it. The task ahead feels almost too big to engage, but the dialogue has begun now that people have a better idea of the scale of the problem, and the ICIJ have promised to release the entire database of so-called “Panama Papers” to the public as an online, searchable resource in the hope that this will eventually force tax havens to maintain registers of personal ownership of shell companies, and by so doing make it easier for governments to track down money siphoned out of their economies. 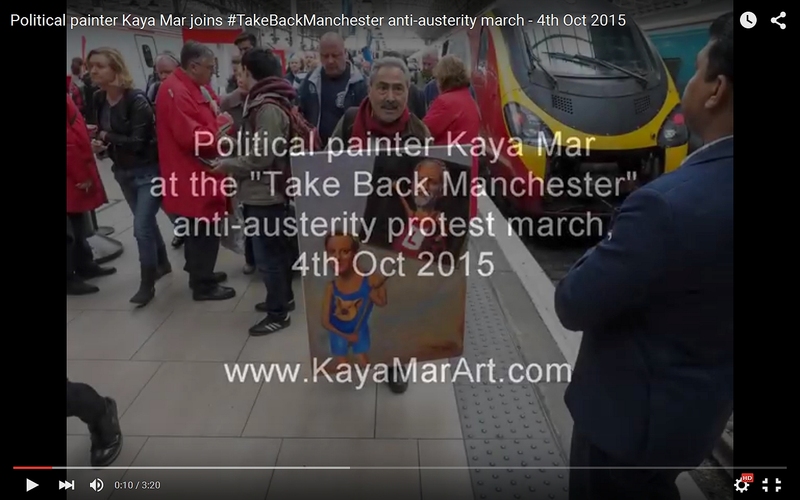 Political artist Kaya Mar unveiled his latest satirical artwork at the “Take Back Manchester” anti-austerity protest, which saw over 80,000 protesters marching noisily through the city as the Conservative Party annual conference opened. It was “All aboard the Krazy Train” again as Kaya headed up to Manchester on October 4th to share his latest painting of David Cameron (sporting his new “PigGate” tee shirt) with over 80,000 good-natured, noisy anti-austerity protesters as they marched through Manchester city centre, doing their best to drown out the opening events of the nearby Conservative Party annual conference with drums, whistles, jeers and *coughs* fruity insults. 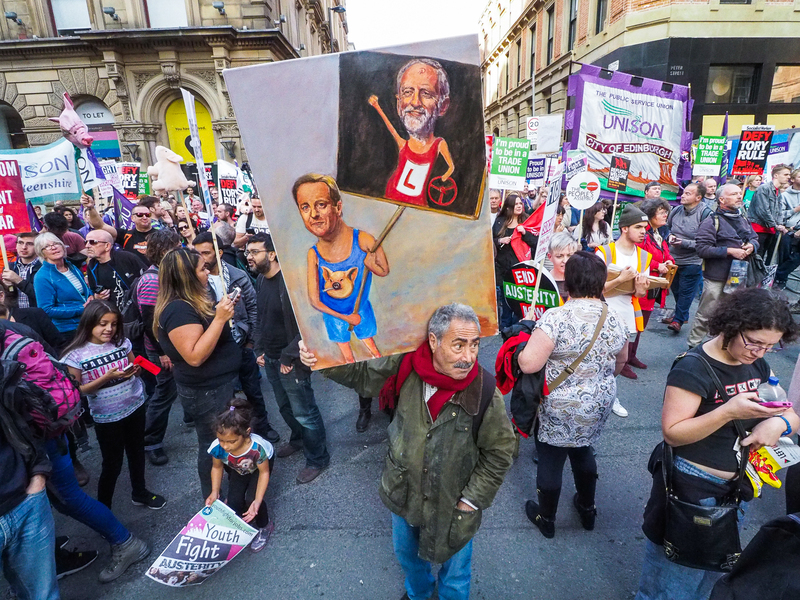 Documentary film maker Dan Laughton films as anti-austerity protesters take photos of Kaya Mar’s painting during the “Take Back Manchester” anti-austerity protest in Manchester. 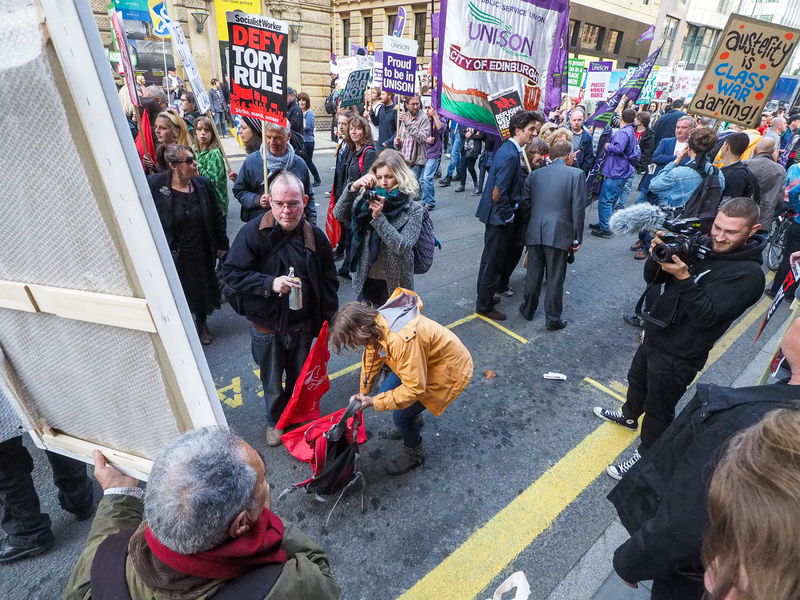 Kaya was joined again by documentary film makers Dan Laughton and Sam Baker (see the Brighton post below) as he was filmed and photographed by the delighted crowds of activists, trade unionists and disaffected members of public. Enjoy the slideshow below of Kaya in action. You’ll also find photos of the protesters and their witty placards HERE. 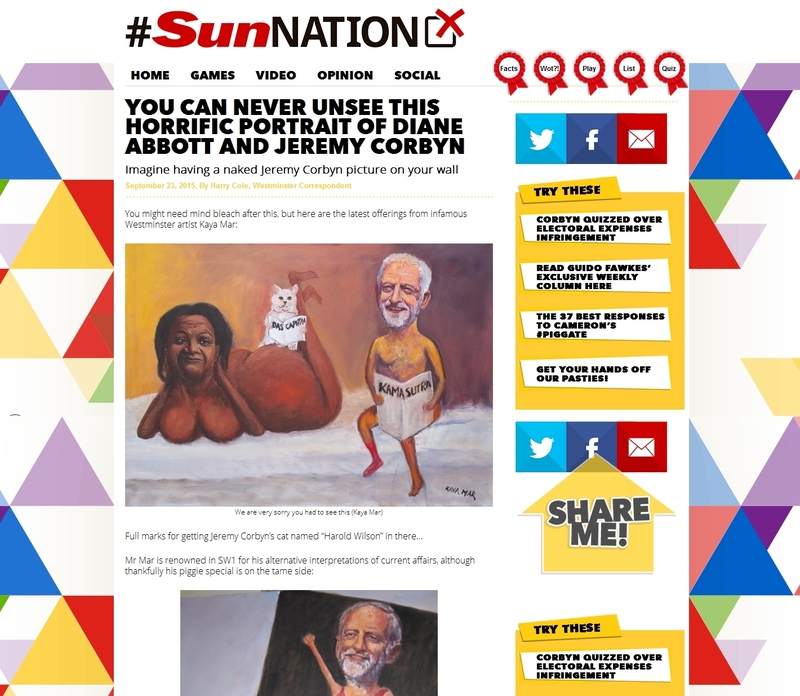 Nobody was more surprised than us when the Sun newspaper’s online website #SunNation ran an article last week featuring Kaya’s latest satirical observations on the revelation that new Labour Party leader Jeremy Corbyn had had a love affair in 1979 with Diane Abbott – news of which raised several million eyebrows and also raised some valid concerns about the wisdom of Corbyn having recently appointed Ms Abbott his new Shadow Secretary of State for International Development. Opinion quickly divided into two camps; on the one hand, say his supporters, this was an affair of the heart which took place whilst he was already separated from his first wife. Despite the lurid tidbits that were published about Corbyn and Abbott living in domestic bliss with their cat Harold Wilson and the pair of them touring East Germany on a motorbike, it was all a looong time ago, and though they remained political soulmates and allies, they broke off the affair and are no longer involved. Corbyn’s critics and detractors, however, wondered out loud just how independent of direct influence from Corbyn would Diane Abbott be in her shadow post, which might eventually become a ministerial position if Labour wins the 2020 general election? As this political story gained more and more traction in the Corbyn-unfriendly press, it seemed like the accusations of nepotism and possibly hypocrisy would quickly create an untenable situation for Corbyn, and, to quote one pundit in the right-wing press “One of them will have to go”. It seemed like things were getting worse for the beleagured leader, only a week and a half into his new job. Was there anything that could save him from this humiliation? And then a miracle happened: On the 21st september the Dail Mail launched the first part of a serialisation of an unofficial biography of Prime Minister David Cameron, written by Lord Ashcroft – a Conservative Party super donor who had been promised a high level government job by way of thanks for all his millions, but who was then completely dumped by Cameron – and journalist Isabel Oakshott. The first installment of the serialisation dropped what can best be described as a political nuclear bomb (smeared with delicious revenge) on Downing Street and David Cameron’s reputation across the planet when it reported allegations made by an unnamed senior Conservative MP that whilst at Oxford University David Cameron had taken part in a bizarre initiation ritual to join an elitist dining club which involved his sexual organs and a dead pig’s head. And that is how a pig saved Jeremy Corbyn’s bacon. A week has passed now, and the worst of it is over. After suddenly vanishing from public whilst the story raged, Cameron finally denied that it ever happened yesterday in his first public statement on the matter, but the fact is that whether he did the deed or not, he has been grievously wounded and humiliated. For the rest of his political life, David Cameron will forever be associated with that deliciously sordid imagery. 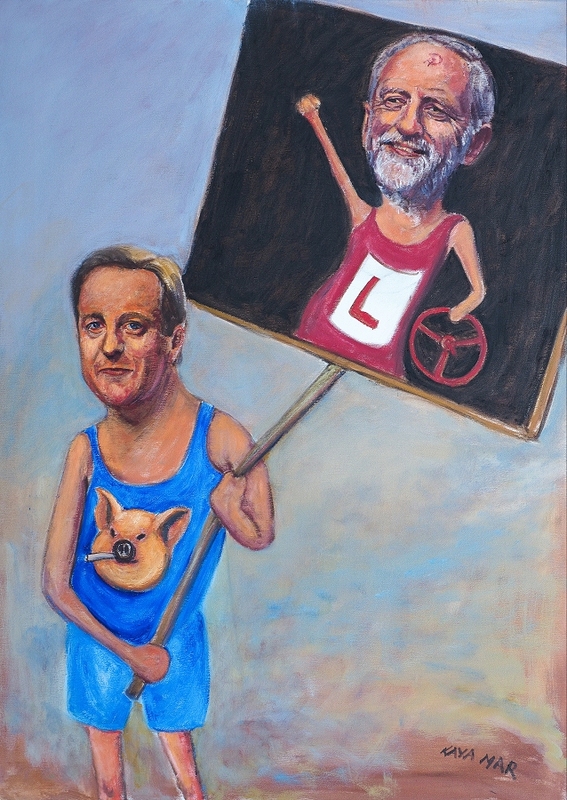 Kaya’s second new painting “David Cameron – #PigGate: Snatching Defeat from the Jaws of Victory” subtly celebrates Cameron’s humiliation. He is portrayed wearing Conservative blue shorts and a tee shirt on which is printed the head of a pig with a joint dangling out of the corner of its mouth. In his hands he is holding a slightly broken protest placard with a picture of a grinning Jeremy Corbyn as a learner driver on it, which refers to Cameron’s former smug glee that Corbyn might become Labour leader, and a widespread assumption was made that this would cause Labour to implode and become unelectable for the next decade.